Bone metastasis is a poor prognostic indicator in melanoma. Some authors have advocated only palliative treatment for patients with osseous disease. We determined (1) overall survival after surgery for bone metastasis in patients with malignant melanoma, (2) the rate of local relapse after surgery for bone metastasis, (3) whether certain patients might benefit from more extensive surgery to reduce the risk of local recurrence, and (4) whether there is an effect of prior radiation on survival and local progression. 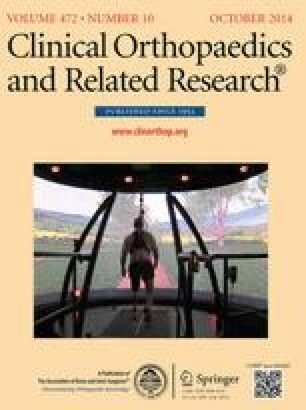 We identified 37 patients who underwent 41 orthopaedic procedures for metastatic melanoma to bone in the pelvis or appendicular skeleton, including 20 for pathologic fracture, from our institutional orthopaedic database and performed a retrospective review of their charts and radiographs. The femur (n = 19) and humerus (n = 11) were the most common operative sites. Kaplan-Meier survivorship was used to determine overall survival and local progression-free survival. The median survival from surgery was 9 months (range, 1–135 months). Kaplan-Meier analysis showed overall survival of 30% at 12 months and 17% at 24 months. Local recurrence developed in seven of 41 lesions (17%). The local progression-free survival was 87% at 12 months and 67% at 24 months. Patients for whom prior radiation failed and patients who did not have excision of osseous metastases had higher rates of local recurrence. Two patients underwent amputation for uncontrolled local progression of disease. Osseous metastasis from melanoma behaves aggressively. The rate of local progression is substantial, and two of 37 patients in this series required amputation for progressive disease. Despite the poor overall prognosis, local control of bone disease is an important issue, and patients may benefit from resection of osseous metastases, particularly if prior radiation has failed. Level IV, therapeutic study. See the Instructions for Authors for a complete description of levels of evidence. This work was performed at the University of Texas MD Anderson Cancer Center, Houston, TX, USA.